I just realized that I didn’t mention this in the blog yet. I was interviewed on the Webcomics Beacon podcast a few weeks back. You can check it out here. If you are impatient, my segment begins at around 18:40. I’m thinking about redesigning the website. I’m inspired whenever I see someone else do a great re-design of their site. Kris Straub just launched a new www.starslip.com. Hopefully my site will look as good as his someday. Good grief, where does Biff shop? I could use some of those for when I babysit. That’s the quicker picker-upper, all right. Wow, those are pretty nifty. I’d probably use ’em all up just playing with them. The only change I’d make to the site is adding the ability to select previous comics without having to click on the current comic’s title first. Must be those “Burly” paper towels seen on The Simpsons. I know what it’s like to, as an artist, see a page and envy it’s color scheme or layout. Particularly when it comes to web pages, theres a certain bias blindness that prevents us from seeing the uniqueness and flavor in the stuff we create. I don’t know how you’ll take this, but Starslip’s design is balls compared to yours. It’s cluttered, honestly. If you redesign, I say at least stick with a simple format that uses the pale warm colors that make Biff what it is. Maybe something in yellow and autumn red or brown. Excellent comic, too. biff finaly found somthing that can compeat with his mental powers. I would add a feature to browse quickly through the archived comics. Say, to jump to an early February 2007 comic. Currently, the best way is to type a random date in February 2007 into the URL, then move around until you get a hit, then type in the name into the URL. Better brwosing possibilities for the comics would be nice. Maybe also a “random”-button (I was gonna say random button, then I realized how silly that sounded). Other than that, the site needs no changes at all. and I NEED some of those paper towels for my next party! XD That made me giggle so. Biff really does have the coolest stuff. There was actually an ad on tv a while back (in Belgium) where this idea is used: something about the water in a bottle next to a roll of paper towels sticking to the side of the bottle. Can’t remember the brand though. Simon, having a random button, as well as a ‘random comic’ button, would be in keeping with ‘Biff’-iness. 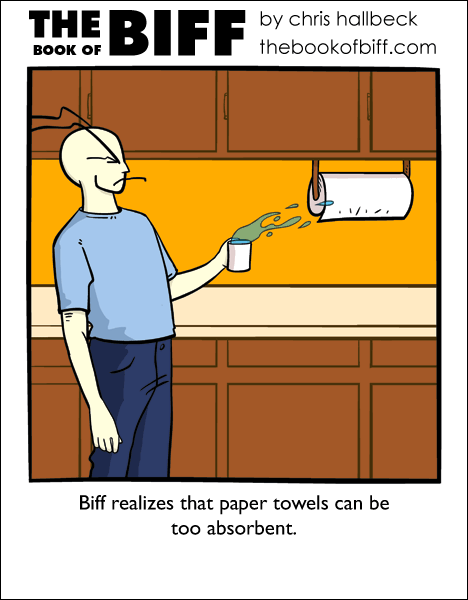 Blackhole paper towels… Nothing escapes their super absorbancy! It’s the quilted quicker-picker upper, BOUNTY!!! I love the design of your website. My only question is: Why is he drinking water out of a mug? Coffee is clearly superior. I wonder if Biff ever gets coffee stains. Like he drinks coffee and his dermatologist (like my dentist) is all, “wha wha lay off the coffee and soda wha!”. I love the design of your page, if you decide to change you have to ask your self why, what are you hoping to accomplish and how is your current site not meeting the needs of your goals. As long as the redesign doesn’t distract me from Biff, I’m good! I think the site if fine, not cluttered, simple, focused on Biff as it should be. A ramdom button would be very Biffish and kinda fun. but other then that I love this page. Simple, easy to use, very Biff. i just love that look on his face. its like what the fu*k? I do not like that starslip website. There is too much going on and the moving advertisements are especially distracting. I like your website much better. Starslip’s site is pretty stock – and I should know, I read twenty-something bloody webcomics. It’s a pretty typical sort of comic in middle of page, arrows below it, blog below that, ads all over the place. Sort of site that starting comics go with. The Biff website is certainly different, and the wide margins that would be a hindrance to other comics is fine for the one-panel format that Biff uses. A random button (such as that found on http://www.smbc-comics.com/ would be great for those with time to burn and with an interest in recalling some of the older comics. In terms of archives, might a suggest a thumbnail view? It’d make it so much easier for people who remember what a comic is about and want to go find it again but can’t remember the title or number (for example, right now I’d like to go find the “Biff discovers that if you stare at the ceiling long enough, it gets angry” comic, but since I can’t even remember roughly when it was put out I’m lost). But that’s just my two cents. Well, with the length, more like two loonies (Canada, eh? ), but whatever. What is the range on the towels? Is it line-of-sight so it does not attract bodily fluids? Does the attraction vary inversely with the square of the distance? I am strangely curious. man, if my mom could get those, she’d die happy of how less work there is in cleaning house. Yet look at his eyebrows they seem repelled by it and his posture is taken aback. And I think it would be best not to have those in you bathroom.